Anyone can use it, its as easy as drag and drop. Beautifully designed 15 themes to select from, high quality, retina ready designs for share icons. Beautifully designed 9 themes for floating sidebars. 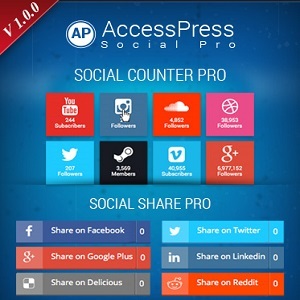 Major 15 social media included (Facebook, Twitter, Linkedin, GooglePlus, Pinterest, Digg, Buffer, Reddit, Tumblr, StumbleUpon, Xing, Weibo, VK, Delicious, Whatsapp). Share via email and print options are also available as an options for sharing. Compatible with woocommerce and buddypress. Latest use of APIs to fetch data. Auto updates on all APIs. Option to select which social media profile to show. Display order for selected social media. Supports custom post types and custom taxonomies. Display options- sidebar, widgets, posts and pages, popup and floating options are also available. Simple option for pinterest share for images.